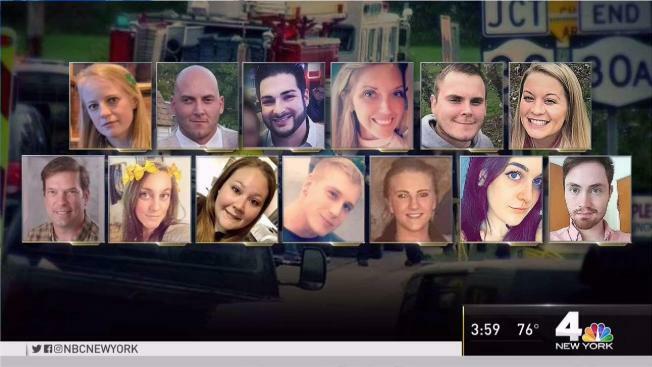 As the families of the victims of a tragic limo accident in upstate New York begin to plan their funerals, the family of the driver is speaking out. Michael George reports. The operators of a limousine that crashed and killed 20 people in upstate New York were grossly negligent in putting the "dangerous and defective" vehicle on the road, according to a lawsuit filed Monday by one of the victim's parents. Amanda Rivenburg, 29, was among 18 people in the limousine that barreled through a stop sign at the bottom of a hill and crashed into a ravine in rural Schoharie, New York on Oct. 6. Two pedestrians also were killed. The lawsuit, among the first filed since the tragedy, seeks unspecified damages in state court from Prestige limousine service owner Shahed Hussain and his son Nauman Hussain. Nauman Hussain has pleaded not guilty to a charge of criminally negligent homicide. State police have said Shahed Hussain is in Pakistan. The lawsuit claims that limousine operators kept it on the road after it failed inspection for brake problems and other issues. A windshield sticker placed on the limousine by state transportation officials deeming the vehicle "unserviceable" was removed before the accident, according to the lawsuit. The lawsuit seeks damages "based on the grossly negligent, willful misconduct and complete indifference exemplified by the defendants and their conscious disregard to the health and safety of the patrons." A lawyer representing the Hussains did not immediately return a call seeking comment, the Associated Press reports. Rivenburg lived in the Albany area and worked for a nonprofit that helps people who have disabilities. Authorities said the 18 people in a limousine and two pedestrians all died from the impact of the accident. New York State Police said Oct. 19 that results of autopsies conducted at Albany Medical Center confirmed all 20 victims in the Oct. 6 crash in Schoharie died from "multiple severe traumatic blunt force injuries." The limo company's operator has been charged with criminally negligent homicide.